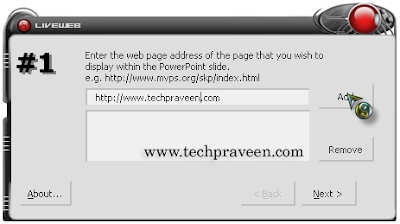 Do you want to Display Live Web Pages in your PowerPoint Presentation ? Then try LiveWeb, a free PowerPoint add-in. LiveWeb will add live web pages to a Powerpoint slide and refreshes the web pages in real-time during a slide show. Its really cool right ? It is just like using your presentation as a Web browser. 1. First download LiveWeb, it supports PowerPoint 97 to the latest 2010. You can installation LiveWeb add-in from the Tools –> Add-ins menu. 3. Click on the Go button to bring up the box that installs add-ins. 4. 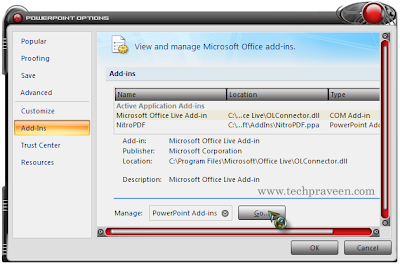 In that newly opened dialog box.Click Add new and set LiveWeb PowerPoint add-in. 5. Now a macro security warning pops up. Enabling macros allows the installation to go through. Follow the below steps for Inserting a ‘Live’ web page on one of your slides with the LiveWeb add-in. 1. From the Insert menu on the Ribbon, click on Web Page in the LiveWeb group. 2. Enter the URL(Eg: http://www.techpraveen.com) of the web page that you want to display in Liveweb Wizard. 3. In the next page, you have the option of enabling a refresh of the web page. A second option enables the placement of a temporary PowerPoint autoshape over the slide to eliminate the whiteouts between page refreshes. 4. Fianally you need to set up some size and position parameters for displaying the web page on your slide optimally. 6. Now your slideshow is ready to display the web pages.